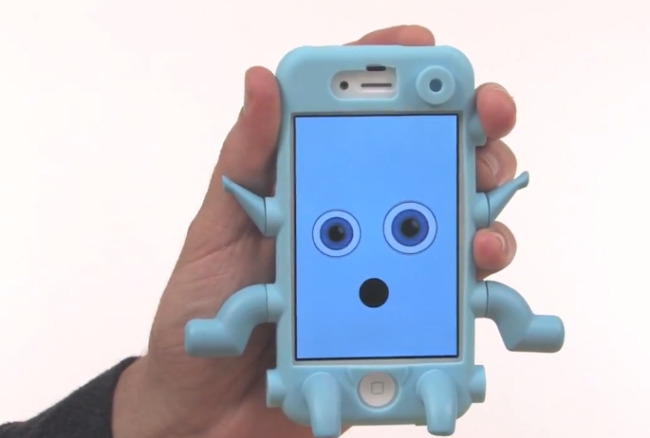 This is one of those iPhone cases that make you ask yourself "WTF is that thing?". This creature of a case is not so ironically called the Creature Case, and it's an interactive case made for the iPhone 4S, iPhone 4, iPod Touch 4G and 5G that is made from silicone and has 21 squid-like nodes that act as shock absorbers as well as let you attach the included 9 different types of bits called limbs which transform the Creature Case into a playful toy. The attachable limbs also act as a support stand for the iOS device. Although the Creature Case was designed to fit the iPhone 4 and iPhone 4S, a cleaver insert layer can adapt the Creature Case to older iPhone and iPod Touch models and even as far as future iPhones. Because a perfect snug fit doesn't really bother your kids right? What makes the Creature Case come to life as a small, cute mutated creature is the Creature Feature app that allows you to add and animate facial features. Either your kids will love the Creature Case, or have nightmares from it. You can pre-order the Creature Case in green, blue and pink for $25 over at Kickstarter. Be sure to catch the video right after the cut! Thanks for the tip, Chelsea! 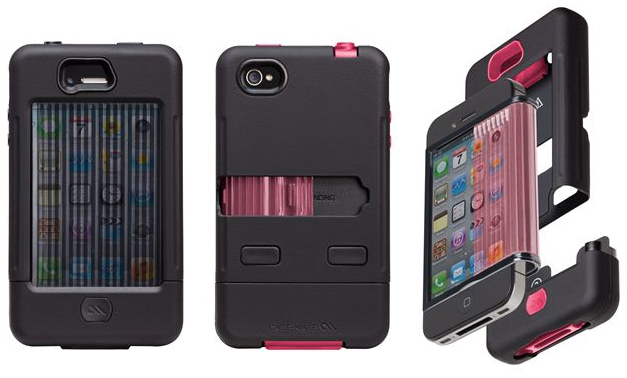 Griffin has added yet another case to its Armored line of tough cases for the iPhone 4 and iPhone 4S today called the Protector. Instead of a dual-hybrid of hard and soft materials, the Protector is made out of matte-textured, extra thick silicone that wraps around the iPhone protecting it entirely and leaving only the touchscreen uncovered. Griffin's Protector is available now in four colors for $19.99. Every now and then we stumble upon some new kind of aluminum bumper, and as you know, we love us aluminum bumper cases. This one comes to us from an accessory company that calls itself GGMM. GGMM's Aviation bumper is CNC machined from a single block of anodized aluminum with anti-slip micro machined jimping to help with grip like we've seen on the Blade aluminum bumper. The Aviation is compatible with both iPhone 4 and iPhone 4S and was designed to have a simplistic slim profile with some interesting aspects. This is certainly not one of those aluminum bumper cases that will make you drool out of curiosity, though it has its own charm and is one of the most affordable all-aluminum bumper we've seen to date at around $25. You can grab one in 7 different colors if you head over to eBay. Case-Mate's latest tough case might be one of the most ugliest cases you've come across, but at least it's one of the most toughest iPhone 4S and iPhone 4 cases Case-Mate has ever made that meets and exceeds military specs. It's called the Tank, seems only fitting for such a case. Yes but what's different about this one that Griffin's Survivor case doesn't have? The Tank case was designed to have a unique retractable screen that shields and fully protects the iPhone's glass screen against impacts, cracking and condensation. The Tank's exterior is made up from a hard, shatter-resistant polycarbonate shell coated with a rubber soft-touch grippy coating and a soft silicone core for more than just drop protection. Sounds like a winning hybrid combination that can take a beating like a punching bag. Case-mate says the Tank's hard polycarbonate exterior shell is 2.5 times more shatter resistant than similar tough cases meeting military specs. Case-Mate's most protective case can be had for $60 of your cold hard cash and comes in black and pink. Video after the break! 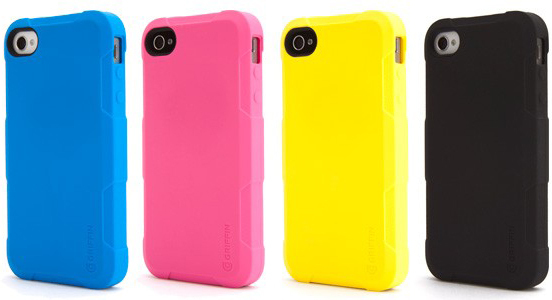 SwitchEasy has never let us down with boring iPhone cases and it has definitely not disappointed its followers today with a brand new case for the iPhone 4S and iPhone 4. You bet it is, this is SwitchEasy's new Rebel dubbed the CapsuleRebelX and it comes in 4 different two-tone mixed colors as well as another 3 solid color options so everyone wil have a favorite color from the get go. 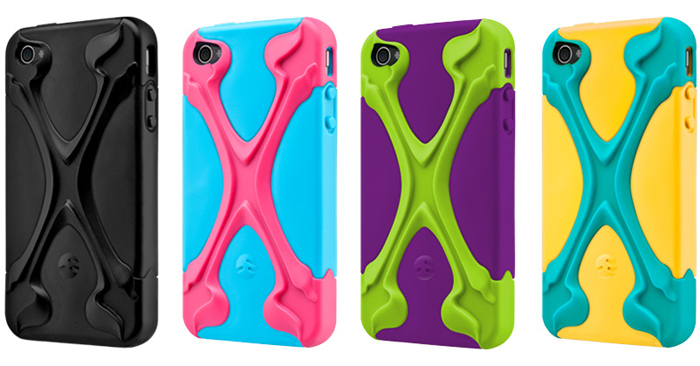 The CapsuleRebelX features the same hybrid design mixing in a hard, grip enhancing swappable X UltraFrame spine made to look like crossbones with a soft and flexible shell for a dual tough protection. It's available now for $27.99.